With the 2018-19 NBA season nearly wrapped, it’s time to focus on the legitimate NBA title contenders. While both Milwaukee and Toronto in the East look like serious threats, the fact is that the West boasts several teams that are considered better bets to win it all this season. But landing that No. 1 seed in the West will be the key to earning the easiest path to the Finals. Although the Denver Nuggets are currently neck-and-neck with the Golden State Warriors to win the Western Conference regular season title, sportsbooks still suggest the Warriors have the best odds to actually win the championship. In fact, if you were to go through a few different sites, you’ll notice the top three contenders are the Warriors, the Houston Rockets (who are now healthy and expected to get back on track) and then the Nuggets. Whichever team you think will win the Conference title, keep in mind that each sportsbooks’ odds are a little different but the top three teams are the same. To get you started, here is a list of places that will accept your bets. All those should have futures odds available so go through each site to see which one offers the best value. Between the three teams, it’s going to be a close call so do your due diligence before putting a wager down. Now, let’s take a closer look at the three teams battling it out in the West. Despite getting blown out by the Pacers on Sunday, the Nuggets continue to roll, pulling within a half-game of the Warriors for first place in the Western Conference thanks to a 7-3 mark over the last 10. 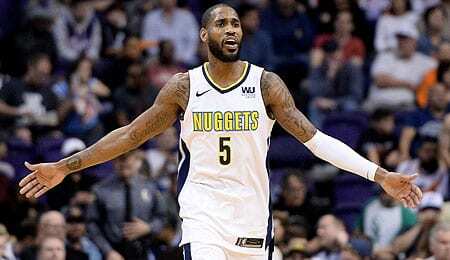 Denver shooting guard Will Barton has struggled to produce consistently since returning from a groin injury in mid-January, so it was nice to see him pour in 15 points in just 24 minutes on Sunday. Still, he turned it over four times, and that’s been more of an issue for him over the last 10 games. On Tuesday, Barton did pull down seven boards, but only managed 10 points (see video below), as he struggled with his shot. His PT is down a smidge this month, and overall he’s averaging over five fewer minutes this season, so has been hard pressed to repeat his career best showing from 2017-18. The Nuggets will need Barton’s secondary scoring down the stretch if they are to overtake Golden State for the No. 1 seed. The Warriors are plodding along at .500 over the last four games and have four losses in their last 10 games — while not exactly a slump — enough to have opened the door for the rest of the West to cut into their conference lead. Of course, Golden State is feeling confident enough that it rested star Stephen Curry on Saturday, losing to Dallas in the process. He was back in the lineup on Sunday, doing his usual thing — 26 points, five treys, nine assists in 35 minutes — and the Warriors beat Detroit. Curry’s three-point shooting has actually been off a bit lately, so perhaps this rest did him good as he nailed 5-of-10 from beyond the arc on Sunday. We all know what he’s capable of doing from downtown when he’s on his game. If Curry is well-rested and ready to roll, Dub City is going to be next to impossible to upend — for either the Western Conference top seed or the NBA title. Houston is currently one of the hottest teams in the West, winning its last two and eight of the last 10 to pull within three games of Denver for the No. 2 seed. Everyone knows the kind of season James Harden is enjoying, but PG Chris Paul‘s showing down the stretch may be the key for the Rockets as they try to make up ground in the race for the No. 1 seed. CP3 put up a double-double on Sunday — his third in five games — and now has 17 for the season (compared to just 14 last season in eight more games). He’s not had to score as much this season, but with 13 assists and five steals on Sunday, he’s finding plenty of ways to help Houston. It hasn’t all been rosy as Paul’s shooting touch is off a smidge lately, and his rebounding is down a tad in March. He’s also had trouble staying healthy more and more in recent seasons, but now that he’s back and going well, Houston’s chances are better than ever. Thirty-seven-year-old songwriter Britney Spears became a pop icon many years back. In 2003, she released her fourth album, In the Zone, and the third single from this effort was “Everytime,” which reached No. 1 on the charts in both Australia and Ireland. Now it’s your turn. Let us know in the comments below who you think will grab the No. 1 seed in the Western Conference. This entry was posted on Wednesday, March 27th, 2019 at 12:22 pm	and is filed under BASKETBALL, Betting, RotoRob. You can follow any responses to this entry through the RSS 2.0 feed. You can leave a response, or trackback from your own site.